One of a kind accommodation in prime location in the heart of North Adelaide . The Fire Engine Suite is a fully self contained, large open plan apartment. It offers a fully equipped kitchen, king bed, king size spa bathroom and his and hers lavatories. 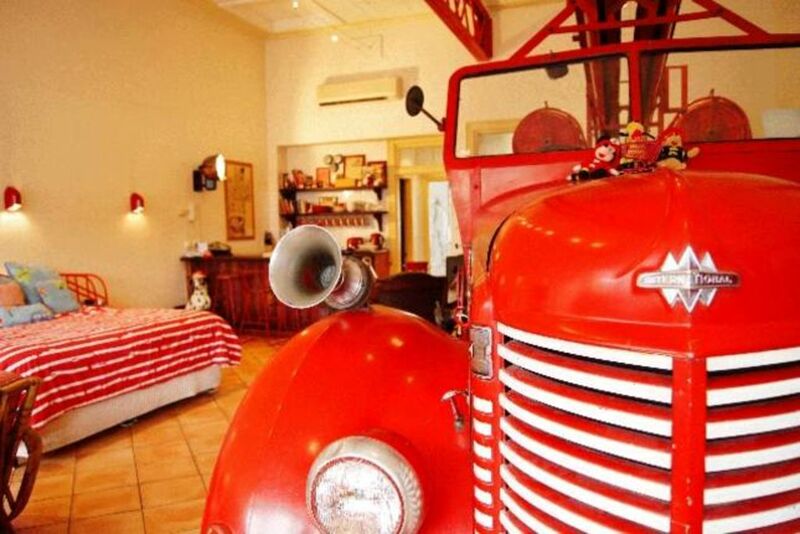 However the highlights of the Suite would have to be the life size, antique fire truck and original fire man's pole in the bedroom! The fabulous Fire Station Inn located in the heart of Cosmopolitan North Adelaide with its huge selection of open air Cafes, restaurants and Hotels is a luxurious boutique style accommodation of three Suites our Fire Engine Suite, Loggia Suite and Residency Penthouse. Specialist shops, including best range of hairdressers in Adelaide. A number of our guests' reasons to stay in North Adelaide is related to the areas abundance of restaurants, cafes and hotel nightlife! If you need more guests to stay please look at our Loggia Suite and Residency Penthouse at the Fire Station Inn also. The Residency Penthouse is a superb 5 star spacious contemporary penthouse suite, restored & designed for our most discerning & VIP guests, of 5 rooms with a sundeck of 7 metres, perched two stories high. It features a two person spa marble tiled bathroom, huge open plan kitchen, dining and living areas. The master bedroom is lightly washed with a creamy rag finish and opens; via French doors, onto a balcony overlooking the North Adelaide Cafe precinct. The second master bedroom with French canopied half testa all Brass queen bed, opens on to the sundeck with designer wrought iron dining table & chairs. Thanks Gemma, we are glad you enjoyed your stay!